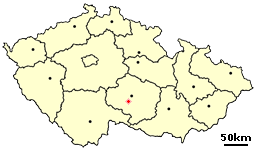 TÅ™eÅ¡Å¥ (German: Triesch) is a town in the VysoÄ�ina Region of the Czech Republic. It has around 6,000 inhabitants. Trest was founded in the break of 12th and 13th century. Joseph Schumpeter was born there in 1883. The Schumpeter family lived there from 15th century.